More information and pictures about Hopton House were sent to me by Linda Briggs. Her mother lived there for a time and attended the Temperance Gell school in the village. Violet England, Olive England, visitor from Canada. The Wilson family emigrated to Canada. 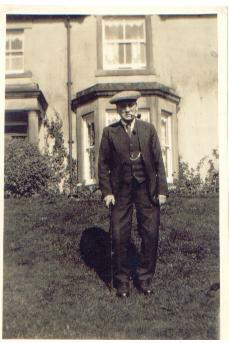 This is Moses Weightman taken outside Hopton House. Concerning photos of Hopton House, I have been in correspondence with Linda Briggs, who is clearly a careful and thorough researcher. She is my second cousin. The exterior views of Hopton House can now be dated more surely. The photo dated c1920 is 1924. 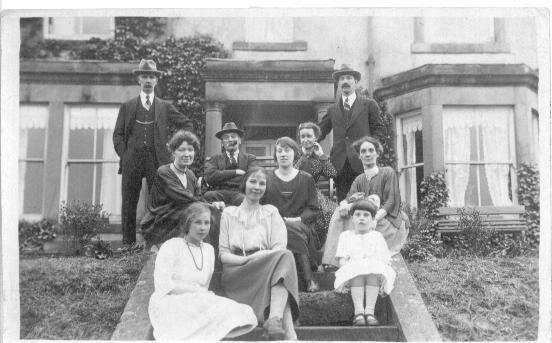 Also, the family group dated c1920 is 1924. The group contains my great-grandparents, grandparents, my mother Violet England, and my aunt Olive England. I am pleased to say that my aunt is alive and well at the age of 94. She recalls the photo being taken (and can therefore date it) and is sure that the exterior was taken at the same time. 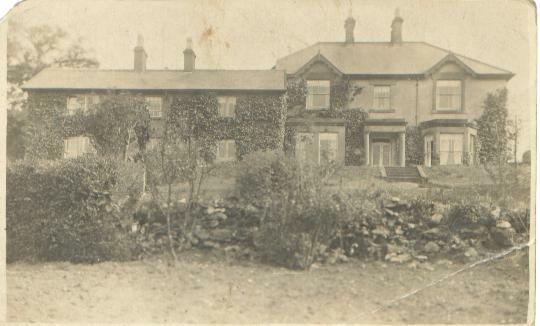 She lived in Hopton House 1924-1944; I lived there 1936-1944. Recently the owners of Hopton House (now converted to holiday accommodation) invited Linda Briggs and her mother, myself and Miss Olive England, to inspect the house in its new guise. We were received very hospitably and the occasion was very enjoyable. We photographed Aunty Olive seated on the same step she had occupied in 1924. Many thanks for your excellent web-site. I've just seen the photo on the Wirksworth site - photo 71. I have other photos of this house taken with the occupiers on the front steps in the early 1900's. My mother, Edna Weightman, lived there for a time and attended the Temperance Gell school in the village. The occupiers I am referring to are the Weightman family, Moses and his wife Jane Key, and their off spring and other relatives. I also have photos of it taken last year. 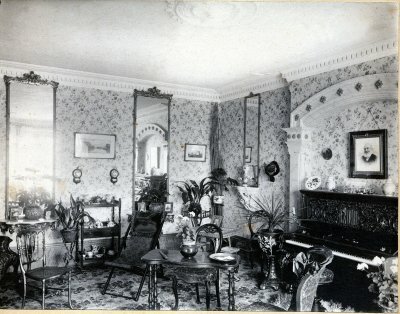 Just seen the photo of the interior of Hopton House. Wow!! Please could you tell me who was resident in the house at the time it was taken, and any other details you may have? As I said on my last email, the house was owned by my family and my mother lived there in the 1920's. It was, and still is, owned by the Key family, and I have photos of the exterior with the family. From what my mother remembers, and from research I have done, the house was bought or built by George Henry Key who was the head of the Key (Estates) Company. This company still exists in the hands of George Henry's grandsons, and their offices are in Carsington at Thornhill House. It was more likely built by them as some of the family are listed as Building Contractors in the 1880's. George Henry's father was in partnership with Wheatcrofts Boat Builders etc. on the Cromford Canal and the whole family played a significant part in the life of the canal as Masters and Owners. I have attached a summary of George Henry. In recent times the house has been split in to two separate homes and occupied by tenants of the Key Estates. In 2001 I saw a piece in the newspaper that planning permission was being sought to turn it into a hotel. What a crime!! My family lived there from the early 1900's. Jane Key (my great grandmother) who was married to Moses Weightman, was the sister of George Henry. Moses and Jane lived there until they died in the 1930's, both in their 80's. They are buried together in Carsington Churchyard. Various of their siblings, children and grandchildren lived there. Their son Ernest Weightman lived there as a bachelor until he died in the 1950's. Moses and George Henry were friends as well as brothers-in-law, and were also business partners. They travelled to the USA on several occasions in the late 19th. century, supposedly on business. Moses was a character and a bit of a rogue. He made a lot of money in his time, but the landlord of the Miners Arms in Carsington got it all. The house is situated on the lane that runs off the main B5035 to Carsington. It is the first house on the left (if I remember correctly) and a little way before Hopton Hall. It has large grounds sloping down towards what is now the reservoir - but that wasn't there then. I think it must have had a different name in 1881. I have searched the census and can't find it. The back of the house is right on the lane - modern day cars practically touch it! There was no land at the back at all. In 1881 my family were in Heage and South Normanton. I would love to have your CD. Can I order one? My mum remembers the piano in the room. She says it was always next to the door. She also says the village had no electricity when she was there, but the house had its own generator in the garden. I think I have now bored you sufficiently!! I will attach the photos in a separate email - scanned by the good old Aunty Vi Norton. On 24th.October 1893 George Henry Key married Sarah Elizabeth Hodgkinson at Heage and they moved to live in the Cromford / Matlock Bath area where he was a landowner amongst his other enterprises. He is listed in Kelly's Directory as living at Greenbank, Matlock Bath in 1916 where he was Chairman of the Urban District Council. He was also a Magistrate. George Henry visited the US on at least one occasion sailing in the Campania from Liverpool to New York, arriving 19 May 1906. He and his family bought land from the famous Arkwright family (Richard Arkwright's descendants) in the 1920's - this was much of the land surrounding the village of Cromford. At that time the Key family owned the Via Gellia Colour Works in Cromford. They also owned the mining rights at Via Gellia where I think they mined the ochre/ore. His great niece, Edna Weightman, remembers family members working at the Via Gellia that she describes as a hole in the ground at a local beauty spot full of ochre - presumably the pigment used for the paint at the Colour works. He died on 20th. May 1958 at his home, Oakhill, Cromford. He left a Will that was dated 11th. March 1958 in which he appointed his 3 sons to be the executors. George Henry was described as resident at Oak Hill, Cromford, a Gentleman and J.P. His sons, Stanley, John Clifford and Geoffrey were described as Company Directors of Home Close, Imperial Road, Matlock; The Rocks, St.Johns Road, Matlock; and The Estate Cottage, Hopton, respectively. The net value of the Estate was £22,322.18.03d. This converts in today's money values as £306,822.73. He left £100 to his gardener Chris Harrison and £300 to Ada Emily Prested. No doubt he had already dispersed of much of his fortune before his death! To John Clifford: all his shares in Cromford Colour Company Ltd. and a third of his shares in Via Gellia Colour Company Ltd. and the Cromford Key Estates. To Stanley: two thirds of his shares in Via Gellia Colour Company Ltd. and a third of the shares in Cromford Key Estates Ltd.
To Geoffrey: all his shares in Hopton Mining Company Ltd., N.Wheatcroft and Sons Ltd., and Derbyshire Fluor Spar Company Ltd., and one third of the shares in Cromford Key Estates Ltd. Geoffrey also inherited his residence at Oak Hill, comprising the house and grounds, two adjoining fields, a cottage and a garage. The residue of his monies was to be divided equally between the three. The Temperance Gell School in Carsington. Mum was a pupil there in 1920 - 1921. She remembers the two teachers were a Mr. and Mrs. Smith, who she remembers as being "horrible". There weren't very many children there, but they were all ages being taught together. In the playground was a small well which she used to play around, and last time she was there -many years ago now - the well was still there. I wonder if it is now?